During this, our 100th Episode, we look back at some of the highlights of the past 100 episodes. We re-visit momentous events, explore the origins of some of the show’s features, discuss some of our favorite PegHead experiences, discuss how we have grown, and much more. 3) Provide their 2017 board gaming predictions and resolutions. Posted on January 8, 2017 January 10, 2017 by inyourearmediaPosted in PodcastTagged games, great western trail, hobbies, humor, table top games. Episode 79- Junk Art and GenCon 2016, CONTEST! 2) All the Pegs review the family style dexterity game from Z-Man/Pretzel Games. Want to win a $50 gift card from coolstuffinc? Then post a Blue Peg, Pink Peg related meme in the space below (or Twitter to @bluepegpinkpeg). One entry per person. 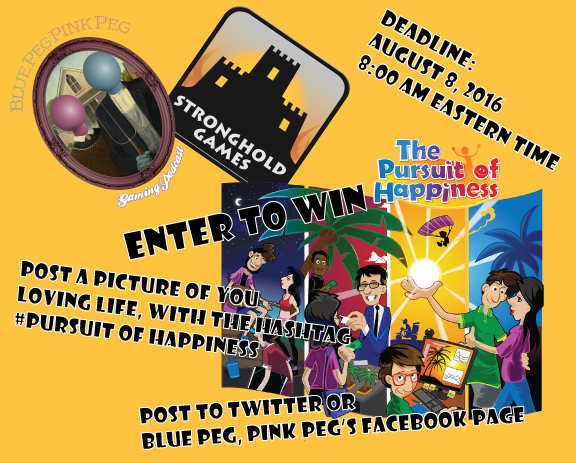 A winner will be drawn at noon Eastern Time on August 26, 2016, so that gives you two weeks. The winner will also be entered in a DICE TOWER NETWORK drawing to win an additional $1000 gift card. Remember, like last year, each of the Pegs will be picking their favorite. Then we will play a game to determine a winner. Pandering will probably help you. Or humor….or creativity. and again ONE ENTRY PER PERSON!!!!! Posted on August 15, 2016 August 15, 2016 by inyourearmediaPosted in PodcastTagged board games, boardgames, comedy, couples, family, games, geeky, Gen Con, hobbies, junk art, relationships, z-man games. 3) Provide their preview of GenCon 2016. Back us on Patreon by clicking here! Posted on August 1, 2016 August 29, 2016 by inyourearmediaPosted in PodcastTagged board games, comedy, dice Tower, family, geeky, Gen Con, hobbies, My Village, relationships. 3) Go back inside the Podcast Studio to discuss their individual game review styles. Posted on July 18, 2016 August 29, 2016 by inyourearmediaPosted in PodcastTagged board games, booty, comedy, hobbies, millennium blades, onitama, patreon, relationships, royals. 2) All the Pegs review four two player games including: 7 Wonders: Duel, The Rose King, Tides of Time, and Thunder & Lightning. Posted on May 23, 2016 May 23, 2016 by inyourearmediaPosted in PodcastTagged 7 Wonders, asmodee, board games, comdey, couples, family, games, hobbies, Kosmos, relationships, The Rose King, Tides of TIme, Z Man. 3) Provide answers to some of your board gaming etiquette dilemmas in their second visit with dear Aunt Peggy. Posted on May 2, 2016 May 3, 2016 by inyourearmediaPosted in PodcastTagged board games, boardgames, couples, Feld, games, hobbies, relationship, relationships, The Castles of Burgundy.